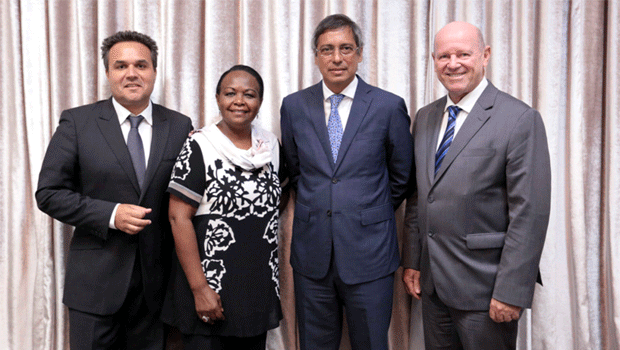 On Wednesday the 13 January Tourism Leaders from Mauritius, Seychelles, Reunion and Comoros met in Port Louis Mauritius to assess the successes of their Vanilla Islands regional organisation in what was their first Ministerial Meeting of 2016. Under the chairmanship of Xavier-Luc Duval, the Deputy Prime Minister of Mauritius the Ministers and Heads of Tourism from the Indian Ocean islands looked at the statement of the audited accounts of the Vanilla islands which was presented by Pascal Viroleau, the CEO of the Organisation and supported by Karine Jasmin of the EXA Firm of Auditors, who are the appointed Auditors. After approving the accounts submitted Xavier-Luc Duval, the Deputy Prime Minister of Mauritius, Alain St.Ange, the Seychelles Minister of Tourism and Culture, Didier Robert, the President of the Regional Council of Reunion and Hissane Guy, the President of the Comoros Tourism discussed on the action plan for 2016 as was presented by Pascal Viroleau, the CEO of the Vanilla Islands. Robert Desvaux, the President of Mauritius Tourism to update the delegates present on the Hotel Classification program being undertaken by the island in 2016. The Vanilla Islands Ministerial Meeting agreed to pursue the approach of moving forward to make the Indian Ocean the sought after cruise ship destination. A decision was also reached of pursuing discussions that would see the creation of a low cost airline in order to ensure better air connectivity for the region. Further discussions on this would be addressed at a next meeting where a studies already undertaken would be table and analysed.